This is the story of how my Dragon Drum came to be. It was over a year ago now, in late August 2010, when I discovered the music of Caiseal Mór via Facebook. The following month I bought a couple of his albums, The Well of Yearning and Flow (I have recently also bought Alchemy for the Heart) as well as 2 of his books, What is Magic? then shortly afterwards, his autobiography A Blessing and A Curse: Autism and Me. 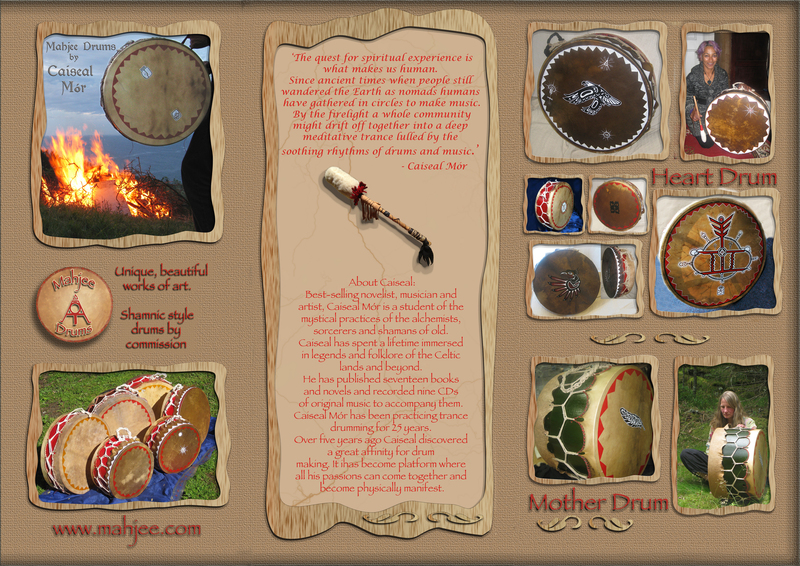 I was fascinated while reading about the process involved in creating his drums, with how he tunes the drum shell, speaks to the skins and also connects with the spirit of each drum he makes. At that stage I’d never seen what Caiseal’s drums looked like, but I already knew I’d really love to have one. I didn’t even know if he was still making drums, or if he’d even consider making one for me. I knew he only made a few each year. At the time I didn’t feel confident enough to contact him so I decided to wait, hoping I’d eventually work up the courage to do it. I guess some people might find that a bit odd, or even silly — but that’s just how I am. I decided that if it was meant to happen it would, all in good time. By early October 2010 I still had not seen any photos of Caiseal’s drums because there were no photos on his website (which has since been totally redesigned and now has lots of lovely drum photos). Unfortunately at that time there were also none on his Facebook ‘fan’ page which I had joined and, as I was not a personal Facebook ‘friend’ of theirs, I didn’t have access to any of the photos that Caiseal and his partner Helen might have had in albums on their private Facebook profiles. Hmmm… I really wanted to see what his drums looked like. I blogged (here) about my enthusiasm to see his drums and my desire to have one. I also decided it was time to perform some magic and create a sigil to put my intentions out into the universe to help me procure a Mahjee drum. October 13th 2010 ~ Suddenly, the very night after I’d created the sigil, I discovered photos on Caiseal’s private Facebook profile which, for some unknown reason, I could now view, including pictures of some of his drums! And the next morning I discovered I could view Helen’s photos as well, and she had more photos of his drums! Woohoo! …sigil magic?! …coincidence? …or maybe a glitch occurred on Facebook, as it sometimes does, and privacy permissions were mysteriously reset? However it happened, the timing was amazingly synchronistic and I was very happy to finally be able to see the drums, after which I was convinced that I definitely wanted one! I copied the drum photos to my private (offline) journal so I could look at them often, hoping that would help me to get up the courage to ask for one to be made for me. I felt as if another tiny step in the journey towards my drum had been taken. November 6th 2011 ~ On Sunday morning, November 6th 2011 I was feeling in a “weird” mood — a wistful, dreamy, otherworldy, psychically sensitive, disconnected from reality state of mind that sometimes happens to me (but is awkward to describe). I am usually drawn to burn incense and light candles when this mood strikes and have great difficulty engaging in any of the mundane jobs around the house that I should be doing. Some people would just call this plain old laziness and procrastination rather than anything “psychic”. 😉 However, after lighting the candles and incense on my altar I opened one of the drawers in the cabinet beside it where I keep a lot of my ‘witchy paraphernalia’ and, still in my dreamy, ‘absent’ state of mind, started rummaging through it, having long since forgotten exactly what little bits and pieces I’d put in there. I found a small piece of parchment-styled paper with an intricate sigil carefully drawn on it in black ink — the sigil I had created a year ago for my drum — along with a couple of talismans created for previous spellwork. I decided it was time to clean out the drawer but it didn’t feel right to just throw the items away so instead I did a small ritual, focusing mainly on the drum sigil, then burned it and the other items one by one in my cauldron to release their energies to the universe. The ashes were then returned to the Earth and the cauldron was cleaned and put away. The mood passed and I reluctantly got on with my ‘housewifely duties’ again. November 9th 2011 ~ Three days later, on the evening of Wednesday 9th, I felt another “dreamy mood” coming on and felt compelled to listen to some of Caiseal’s music, which I hadn’t played for a while. As usual I lit some candles and incense and while listening to the music I decided to check out his public Facebook page, which I also hadn’t done for quite some time. 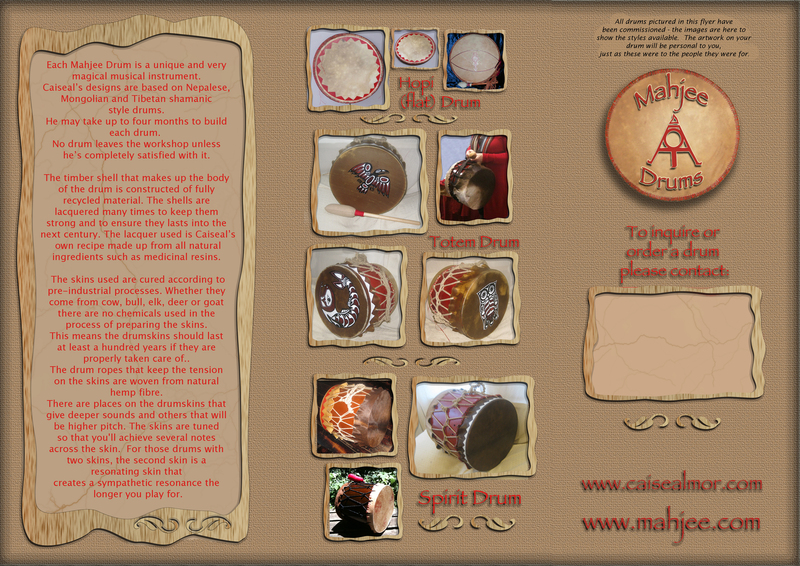 I was ecstatic to see that Helen had created and uploaded a beautiful flyer to promote Caiseal’s drum-making and she’d posted a message encouraging people to contact them if they’d like to commission a drum! Woohoo! I noted that the flyer had been uploaded on Saturday evening, November 5th — only 12 hours or so before I had ‘randomly’ felt the need to do a ritual, burn my drum sigil and start thinking about a Mahjee drum again …hmmm …coincidence? …or not?! Finally, the perfect opportunity! I sent a message to them via the contact page on Caiseal’s website and included a link to my blog about my drums so they could understand my requirements and advise me which style of Caiseal’s drums would be most suitable for my needs. Helen replied the following morning and, having read my blog, was wondering what prompted me to contact them when I did as, unknown to me, Caiseal was actually starting on the first drum in his latest batch that very day. She said he sometimes only makes one or two batches a year, so the timing of my request was interesting. She was also wondering if maybe the universe might have sent me as part of the ‘help’ she had asked for in manifesting extra, sudden, unexpected income. Gotta love synchronicity! November 14th 2011 ~ Below is a composite of the very first photos of my drum, sent on 14th November so I could see how the colour had turned out …which I was very pleased with. The skins are still wet in this photo and would probably change colour slightly as they dried. The next stage was to decide on what artwork I wanted Caiseal to create for me. Naturally I wanted a Dragon on the drum, and although I didn’t know exactly what I wanted it to look like I knew it had to be a “western” dragon rather than an “eastern” dragon. I sent a few examples which I found online, then instead of seeing Caiseal’s final design first (which was offered) and discussing it and any changes I might want, I decided to take a leap of faith and trust that Caiseal had been guided to create something I would really like. I am very happy with the result …I love it! 😀 Here’s the first photo of it, taken not long after the painting was finished and well before the drum was sent to me. November 19th 2011 ~ This dragon has wings which look feathered rather than typically leathery or scaled. The black feathers immediately reminded me of the raven, a bird who symbolises wisdom and knowledge-keeping and whose spirit is also associated with The Morrigan. I have enjoyed working with both Raven energy and The Morrigan in ritual. The seven rows of feathers and the seven large dots or circles brought to mind the seven main chakras or energy centres in the human body, as well as the seven classical planets of astrology and the days of the week they gave their names to. Seven can be a symbol of perfection, effectiveness and completeness. Circles were protective emblems to the Celtic mind and were often drawn as protective boundaries, not to be crossed by enemy or evil. Circles were also Celtic symbols of the cosmos – noting in symbol the intangible procession of time. The circle symbol meaning is universal, sacred and divine. It represents the infinite nature of energy, and the inclusivity of the universe. Additionally, the formal style of the wings brought to mind pictures I’ve seen of ancient winged disks, the symbolism of which was also associated with serpents (dragons), seraphim (angels) and the Tree of Life. The wings and long slender legs with talons outstretched did briefly speak to me of Phoenix and Eagle (2 birds associated with my sun sign of Scorpio) but I think in this case Raven squawked the loudest. 😉 Funnily enough, decorating the wall above my altar are masks that I have made and my Raven and Dragon masks are right beside each other. A couple of the images I initially sent to give Caiseal an idea of what I liked were based on the yin-yang symbol. That has been included by way of a small ‘yin-yangish’ symbol (balance and continual transformation) with a ‘Celtic leaning’ (looks like a cross between a yin-yang and a spiral on the dragon’s head). I see so much intricate detail and symbolism in the design overall — the triskele-like design on the wing (the importance of 3; cycles; realms of Land, Sea and Sky; Lower, Middle and Upper worlds; Maiden, Mother and Crone). The spirals also represent balance, progress, direction, initiation, centering, expanding, awareness, connection, journeying, development, potential power or even ideas and truths yet to be expressed. I see the red triangles or spikes with dots along the dragon’s back as being dragon energy, flowing up and down the spine in a controlled manner, waiting to be unleashed. I also like the dots because they’re a painting style I used on my Water Dragon drum. Even the folds and wrinkles on the inner edge of the tail speak to me of potential energy waiting to be expanded and released. There are 21 (3×7) visible folds inside the dragon’s tail which of course links the 3 and 7 mentioned above. Numerologically speaking, sevens and threes deal with magical forces. Three deals with magic and intuition while Seven deals with esoteric, scholarly aspects of magic. Oooooh I’m enjoying this …the more I look the more I see! The tip of the tail has a tree shape inside it. Trees are a symbol of life, antiquity and strength and are often considered as bearers of secret knowledge and wisdom, as are dragons. Then there’s the symbolism of the Dragon itself, one of the most powerful totems, representing a huge range of qualities, emotions, and traits including strength, courage and fortitude, change and transformation, wisdom, infinity, longevity and movement through space and time. Dragons are also messengers of balance and magic, encouraging us to tap into our psychic nature and see the world through the eyes of mystery and wonder. Dragons are the embodiment of primordial power, the ultimate ruler of all the elements. 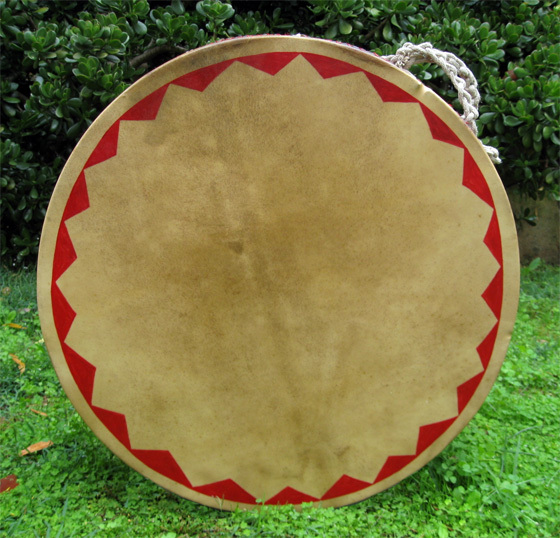 The triangles around the edge of the drum are Caiseal’s signature style. I think he puts them on most, if not all of his drums. Here on my drum they make me think of dragons’ teeth or the triangular spikes typically seen along the backs of most dragons (including this one, of course). Maybe I’m reading far too much into this. 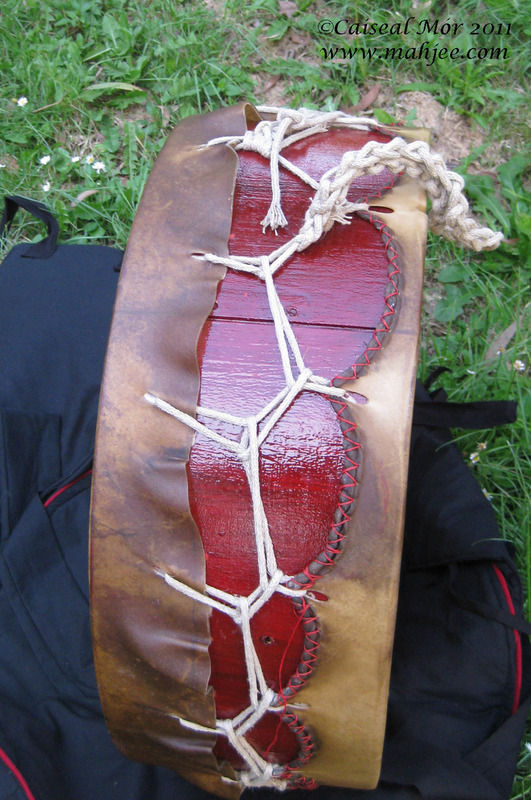 I don’t know whether Caiseal had any of this in mind as he created the design, but it’s what is being conveyed to me now when I look at the artwork in the photo of my drum (at the time of writing this I don’t actually have the drum yet). Dragon feathers and the element of Air? 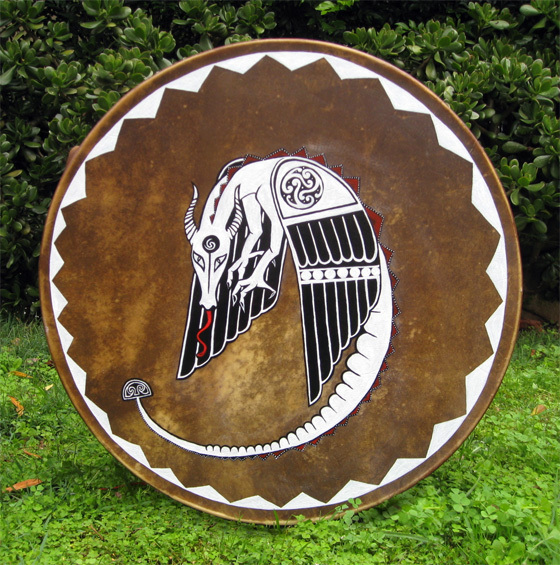 I feel that perhaps this dragon drum is aligned with the element of Air, as there are so many symbols (as I see them) that correspond with Air. The element of Air represents the realm of thought and imagination, knowledge and wisdom, reason and intellect, communication and expression. It is associated with the senses of smell, hearing and voice. Symbols of Air include feathers, birds, dragons, circle and dot. 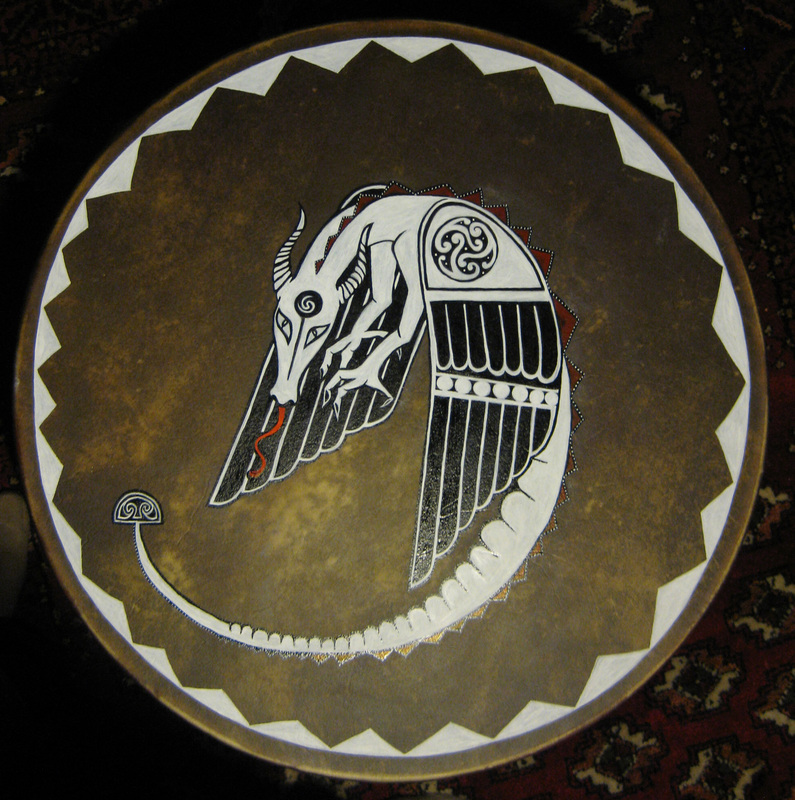 I’m hopeful that as I get to know this Air Dragon drum, through playing it and trance journeying with it, that it will eventually convey its name to me, like the Water Dragon Drum I made did during a meditation about that drum. If it does give me a name I could incorporate its name, written in runes, into artwork which I might do on the second (resonating) skin some day. November 22nd 2011 ~ I’d been expecting to hear any time now that the drum had been sent but on Tuesday evening I received an email from Helen explaining that they hadn’t sent the drum yet as Caiseal decided he wanted to paint more on the back of the drum. He had run out of red ink but the delivery of more ink came that day so he was adding red triangles around the rim of the deer skin. She also added, “It’s getting lots of love, your drum :).” Yay! 😀 I had been thinking that the back of the drum would look a little ‘naked’ compared to the front and I also felt it needed a bit more red on it somewhere. The red triangles would look great on the paler skin. There’s certainly no hurry and I was happy for Caiseal to add whatever he felt it needed. November 23rd 2011 ~ So far this whole blog post has been written during the drum’s creation, while waiting for it to be completed and finally arrive here at its new home. 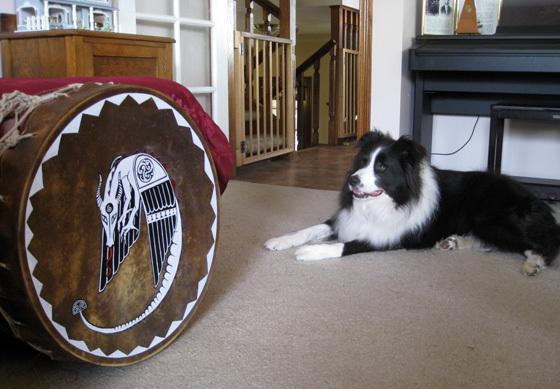 I felt inspired to write about my ‘journey’ to getting this drum and all the synchronicities involved, adding the photos Helen sent and also to describe all the symbolism I could see in (the photograph of) Caiseal’s artwork on the drum. The artwork is definitely ‘resonating’ with me and I feel a kind of connection to the drum already. 🙂 I’m looking forward to seeing how it feels when I have the actual drum rather than just photos. I then spent the next couple of hours playing the drum and acquainting myself with its beautiful, deep, resonant voice and finding the different notes it could produce. My dog Shelby, who was initially very curious but also slightly wary of the “New Thing”, had given it a thorough sniffing and was now content to lie at my feet listening to the drumming — something he doesn’t do when I play my djembe. Obviously the sound of this Heart Drum is much more pleasing to his sensitive doggy ears. 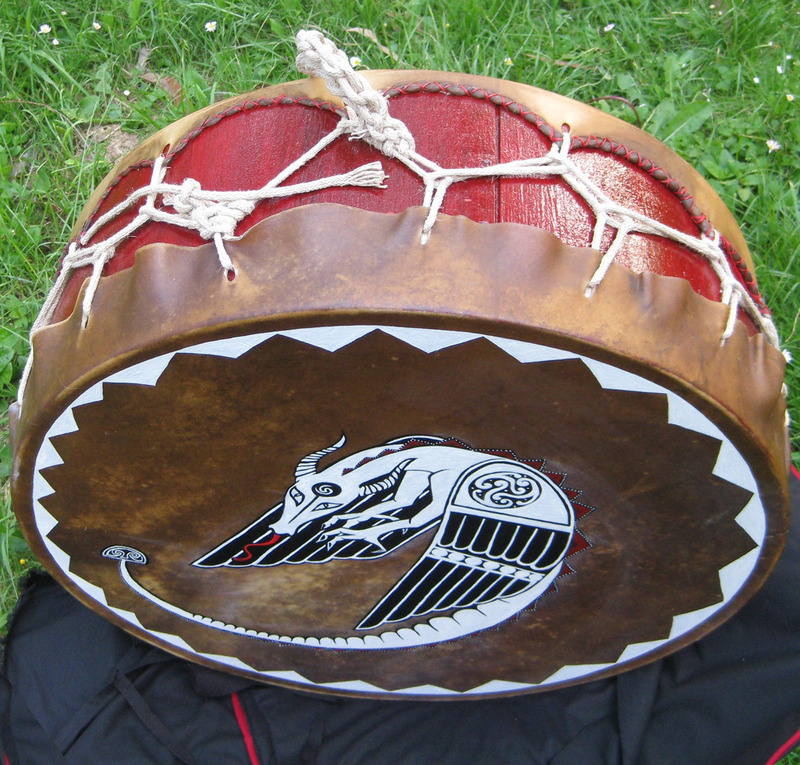 These latest photos also show the red triangles painted on the back of the drum by Caiseal, as well as the drum beater which is a work of art in itself. 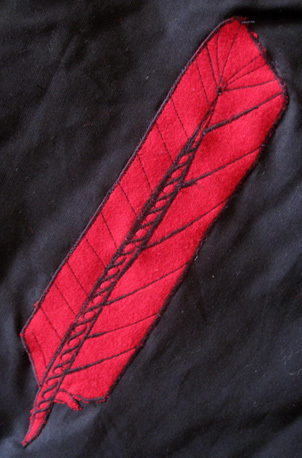 Bag: Black cotton lined with red poly/cotton quilting, trimmed with red wool-blend, decorated with a red wool-blend dragon feather. 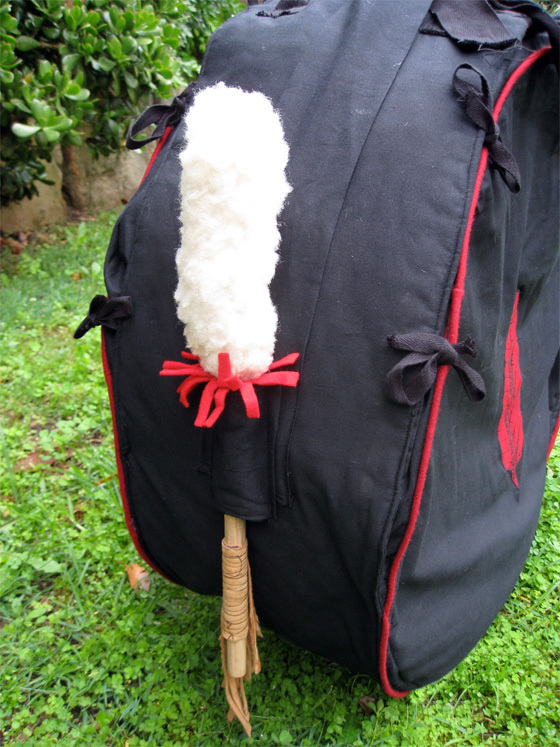 Beater: Maple handle, white sheepskin head, deep red wool wrap. 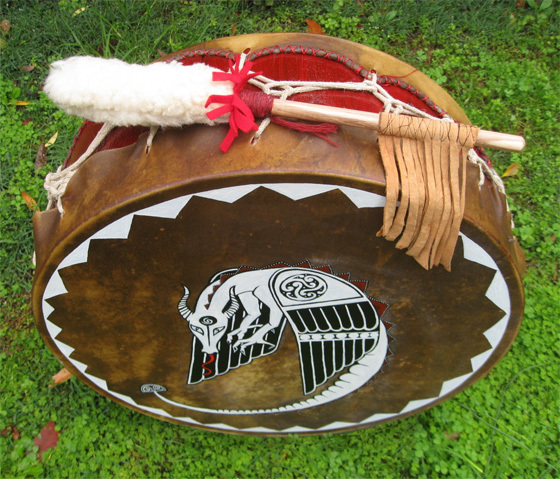 Read about my first trance journey with this drum ~ On the Wings of My Dragon Drum. 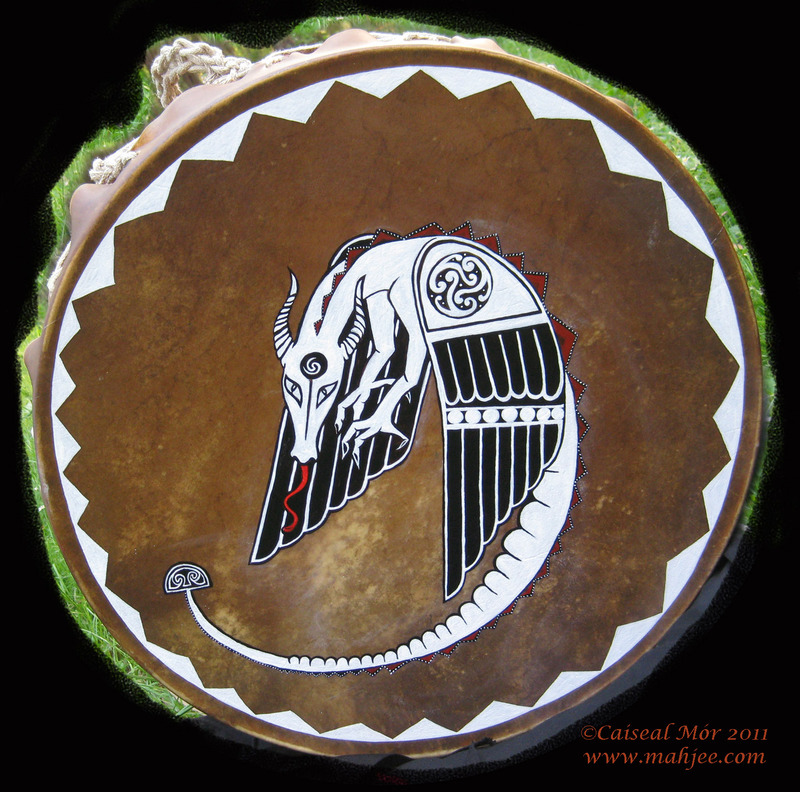 This entry was posted in Art & Craft, Dragon Images, Magickal Tools, Personal Musings and tagged Caiseal Mor, Mahjee Drums, sigil, sigil magic, synchronicity, trance drumming. What a fascinating story! I wish you luck with your new drum, and hope to read more about it. I don’t read much blogs, but Caiseal posted this link. Must be very nice for the creator to read. Hi Ingunn …thank you for your kind words and good wishes. Happy Holidays and Solstice Blessings to you.